#LegendaryNightBoxing: "Cris Alfante is well prepared to face Agbeko; has sparred about 80 rounds so far"
With all preparedness by selected boxers towards the Legendary Night Boxing scheduled for April 29, 2016 in Ghana; Manager/Promoter of Philippinian Super Flyweight title holder, Cris Alfante, Gabriel 'Bebot' Elorde Jr. has indicated that his boxer has intently sparred about 80 rounds the past 2 months in preparation to face Agbeko in the ring. The Philippian Super Flyweight title holder, Cris 'Asero' Alfante will be bouting against Ghanaian 3x World Bantamweight Champion, Joseph 'King Kong' Agbeko at the Accra Sports Stadium. According to Bebot, "Cris has been training for 2 months now and has sparred for 80 rounds in preparation of his fight against Joseph Agbeko." Adding, "More so, he has still to make 30 rounds of sparring before he enters the ring with Agbeko." Contacted by amalarbieafrica.com via email; Manager/ Promoter, Gabriel ‘Bebot’ assured Philippians and boxing enthusiasts asserting, "Cris will do everything to win this fight." Born Chriscilmar Gonon Alfante, the Super Flyweight title holder has had 17 bouts with 11 wins (4 KOs), 5 losses (3 KOs) and 1 draw. His last fight was with Ryuko Maekwa (a draw) on November 7, 2015 at Korakuen Hall in Tokyo, Japan. 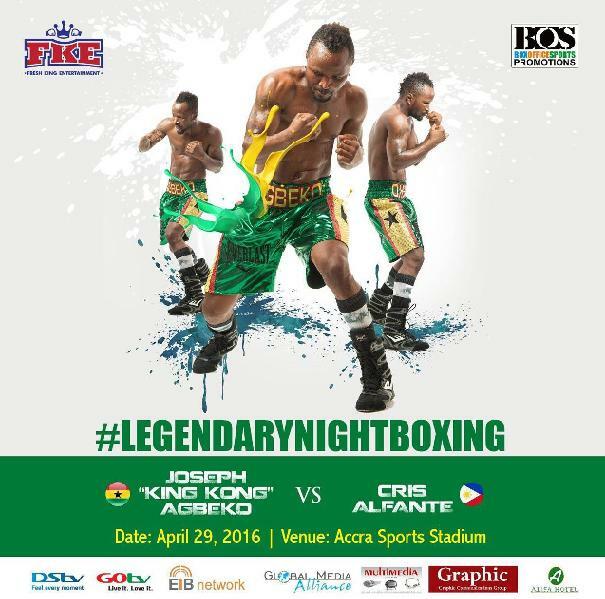 Organized by Fresh King Entertainment and Box Office Sports Promotions; the #LegendaryNightBoxing was launched at Alisa Hotel in Accra on Tuesday, March 29, 2016.